The first necessary action I had to take (besides picking the berries) was to go out and round up my supplies! This task surprisingly was not difficult at all. 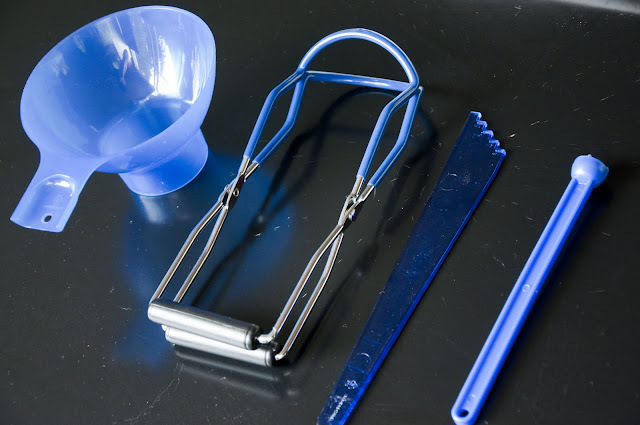 I knew I needed jars, rims, lids, a jar tong (grabber thingy... see picture), magnetic lid grabber, jar funnel and Sure Jell Pectin (reminds me of a gelatin or cornstarch, used to thicken the jam). These are not supplies I have ever had a reason to look for or notice, where do I go to find and purchase them? I decided that Target would be a logical place to start. After browsing the store for a bit (it's target, you have to!) I didn't manage to stumble upon what I needed, but after asking store help I was directed to a little section devoted to canning! Score! For about $20-$25 I was able to purchases everything I needed (jars were sold in cases of 12 with lids and rings included, I bought the 8oz ones) besides the Pectin. 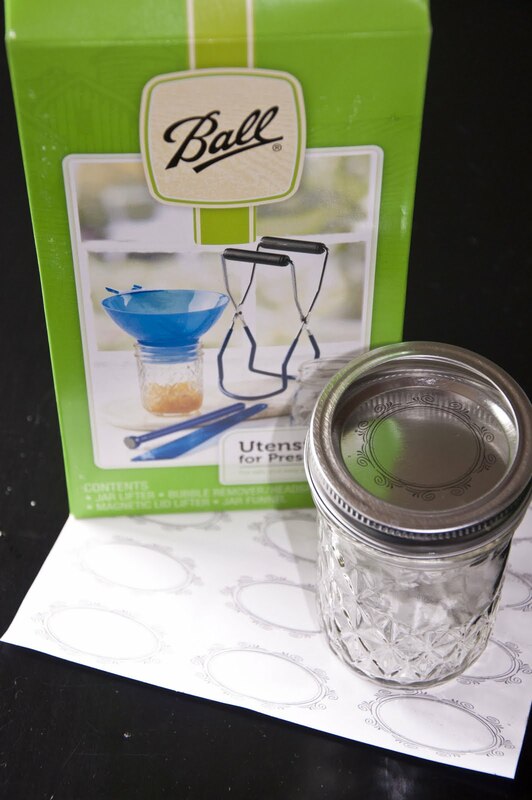 The price of jars can add up, BUT you can reuse jars and rims. You only need to repurchase lids each time you can. When it comes to gifting jams to friends and family it is perfectly acceptable to kindly ask for the jars and rims back after the jam is finished. I am currently storming up so cute little tags to go with my jams that address this. Pectin was the least questionable item to track down. I was confident Safeway would carry it and sure enough on the top shelf in the baking aisle, to the right of Jello and pudding, there it was! 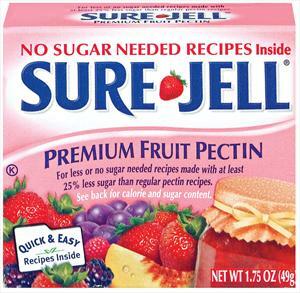 There were two types of Pectin I was debating between: little to no sugar Pectin and regular Pectin. I'm not much of a nutrition guru so though I studied the facts and ingredients I couldn't figure out what was actually different between the two. All I knew is that one would require 4 cups of sugar and the other would require 7 cups. If anyone out there knows, please let me know! Because I would rather have my jam take 4 cups of sugar than 7 cups, I bought the little to no sugar Pectin. It is important to first sanitize your jars. Depending on how serious you are about sanitation, this could be washing with hot soapy water then drying, washing with hot soapy water then boil and dry, or just running jars, lids, and rims through the dishwasher on high heat water and and high heat drying cycle. I went with the dishwasher option. Once the jars are sanitized, they should be kept warm so as not to crack the glass when the boiling hot jam is being poured in. At first I followed online information and kept the jars in a water bath, but my mom called part way through the process to get my canning update and informed me that it will save me a headache if I instead place the jars on a towel lined cookie sheet and set them in the oven on warm. 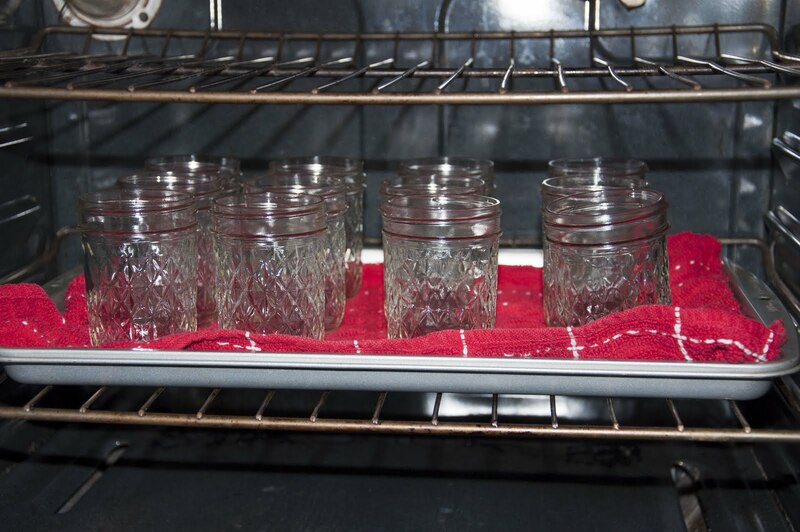 This way, I won't need to worry about drying hot jars while also rushing to fill them! Genius! Thanks mom! 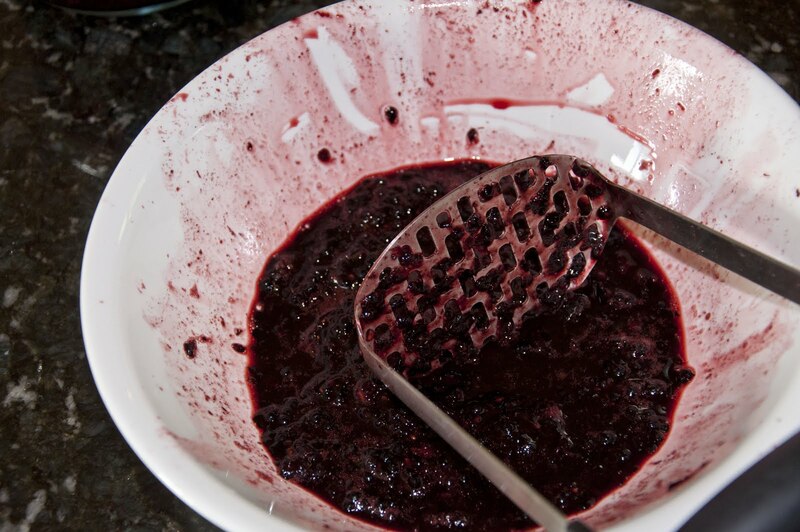 To mash your berries it is most convenient to use a potato masher. 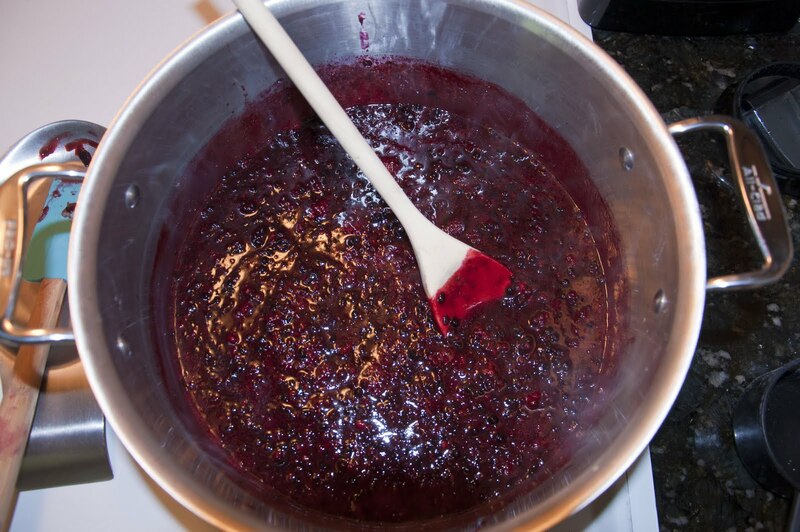 The process doesn't take more than about a minute, remember that jams do have some chunks in them but it is a matter of preference. 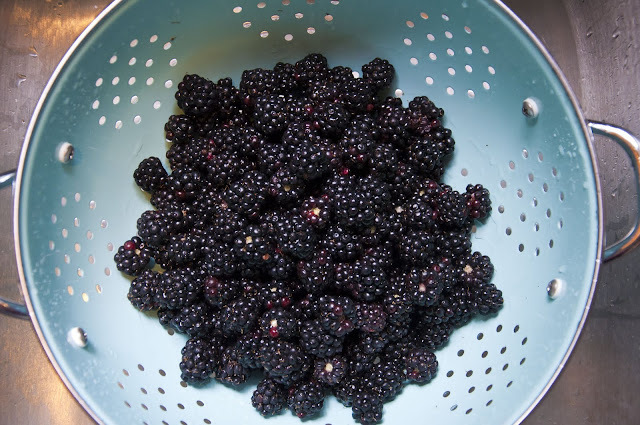 The mashed berries then go into a decent sized saucepan (instructions call for a 6-8 quart saucepan) and placed onto a cold burner. 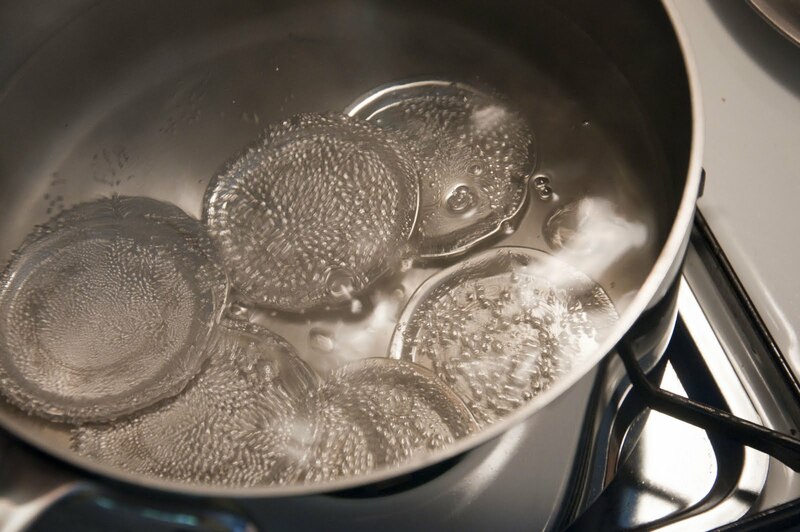 At this time you will need to place lids in a saucepan, cover with water, and heat to a soft boil. Lids will remain there until jars are full. Also fill a stock pot 1/2 full of water and turn burner on high. Water will need to be at a boil or close to a boil soon after jars are filled. Sugar is next. 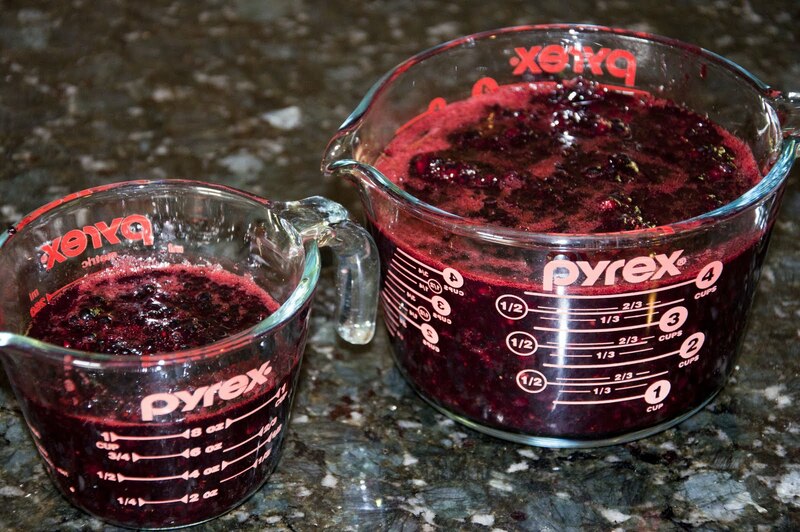 Before directly pouring the sugar into the berry filled saucepan, measure out 4 cups of sugar into a mixing bowl. 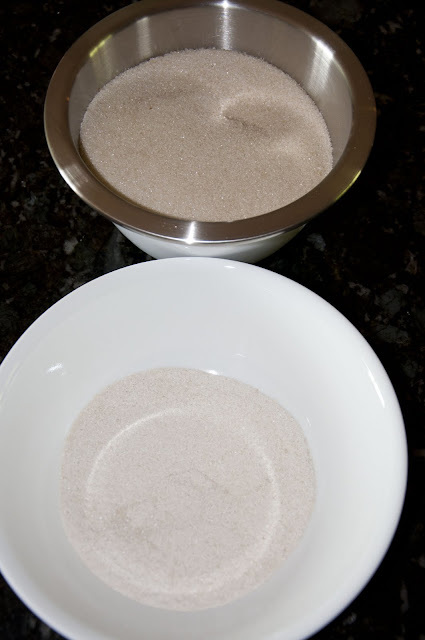 Next, empty Pectin into a smaller bowl and measure out 1/4 sugar from the 4 cups of sugar bowl to mix with the Pectin. Stir the Pectin-sugar mixture into fruit in the saucepan. Add 1/2 teaspoon butter or margarine to reduce foaming. Turn burner on median high-high and bring mixture to a full rolling boil (rolling boil means that even when mixture is stirred, it will continue to boil). Stir constantly. When the saucepan mixture reaches a rolling boil quickly stir in remaining sugar. Return to a full rolling boil and boil for exactly 1 minute stirring constantly, then remove from heat. Remove jars from oven. Using the jar funnel and ladle, fill jars within 1/8 inch of top. Wipe jar rims and threads. Next, use the magnet to remove lids from the hot water and place on top of each jar. Finish by screwing rims tightly (as possible, jars are hot) onto the top of the rims and jars. Using the jar tongs, carefully set jars at the bottom of the stockpot filled with gently boiling water. Make sure the jars are covered by at least 1-2 inches of water. Bring water back to a gentle boil. The instructions say to cover and boil for 10 minutes, however I completely forgot to cover my stockpot until the last three minutes and it still worked. SO, if you do not have a lid for your stockpot, I don't think it will be a problem. If you are concerned, you could just boil your jars for a couple extra minutes. After the 10 minutes CAREFULLY place jars upright on a towel on a surface they can sit for 24 hours without being moved, cooling completely. When jars are cool you can check the seal by pressing the middle of the lid with your finger. If the lid springs back the lid is not sealed and the jar will need to be refrigerated. You will typically hear the jars seal, they pop! This is actually rather exciting. One of my jars popped as soon as it came out of the water! Within 10 minutes of my jam sitting on the counter all 7 jars popped! I remember how excited I was when I was upstairs and heard the 7th pop! 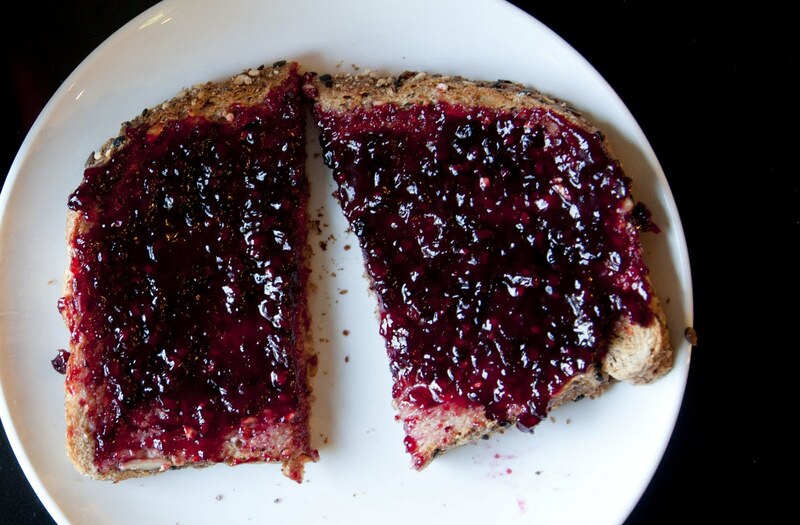 Unopened jams can be stored in a cool, dry, dark place for up to one year! 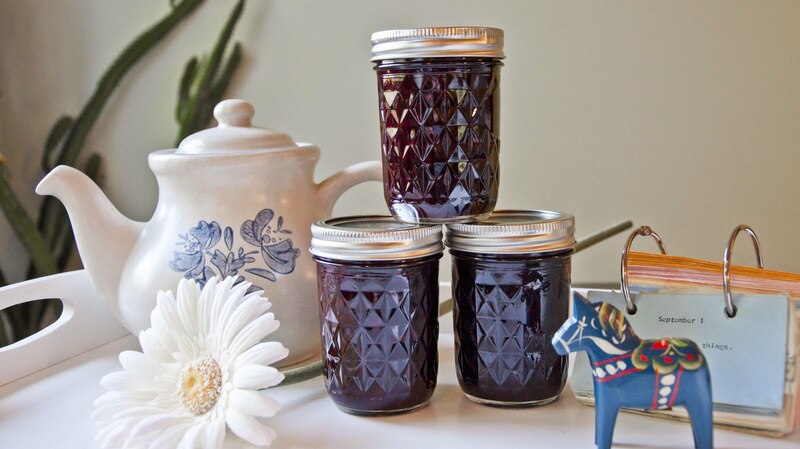 Refrigerated opened jams are good for up to three weeks. These are both according to the Pectin instructions but I know from my childhood we ate jams over two years old that had been unopened. We also consumed jams that were refrigerated for a couple months. It's all about your comfort zone. Hope this helps and inspires you! I'm already planning on making another batch soon and dreaming of moving on to other types and styles! If you have any questions, like always, don't hesitate to contact me! This is BRILLIANT. I hate boiling the jars, it's messy and burn inducing. Your mom is a genius. I made sugar free ginger apricot jam a while back, it didn't set properly, I did use the right pectin tho. This post makes me want to try again! Way to go Lena!